Eagle River Watershed Council Rifle Falls is home to Colorado’s only 80-foot triple waterfall. RIFLE — The Eagle River Watershed Council invites the community to learn the ins and outs of the Rifle Fish Hatchery on Friday, June 29. The hatchery produces cold-water species, including fingerling and catchable rainbow, cutthroat, brook and brown trout. It is also the largest state-owned and operated trout production hatchery in Colorado. Rifle Falls stocks stream sections, lakes and reservoirs in western Colorado, including Eagle County, and provides catchable trout for stocking along the Front Range. Cutthroat trout are also raised for aerial stocking. 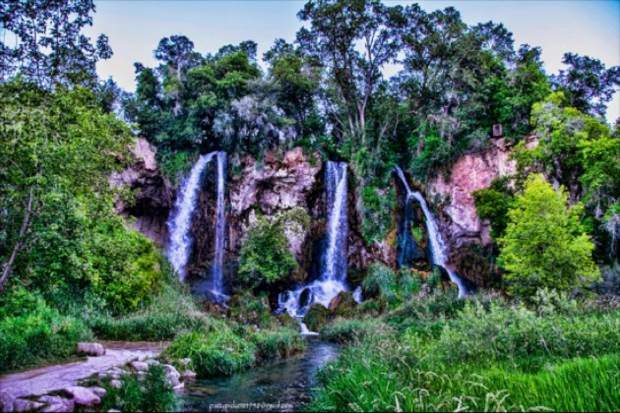 Rifle Falls is home to Colorado’s only 80-foot triple waterfall. The event will include time to take a mellow hike to explore its nearby trails and limestone caves. Transportation from Eagle to Rifle will be provided, with a bus leaving Eagle at 10 a.m. and returning at 2 p.m. Friday, June 29, and the event includes a picnic lunch. Spots are limited and must be reserved. Those interested should contact the Watershed Council at 970-827-5406 or email schoder@erwc.org. A $15 suggested donation is encouraged. To learn more about the Watershed Council, visit http://www.erwc.org.